On Tuesday, Shinichi Tanaka, Chairman of the Nuclear Regulation Authority in Japan warned the press that low-level contaminated water stored at the crippled Fukushima Daiichi nuclear power plant represented one of the biggest obstacles for the decommissioning process. Tanaka advised that this obstacle could be avoided by releasing contaminated water into the Pacific Ocean. 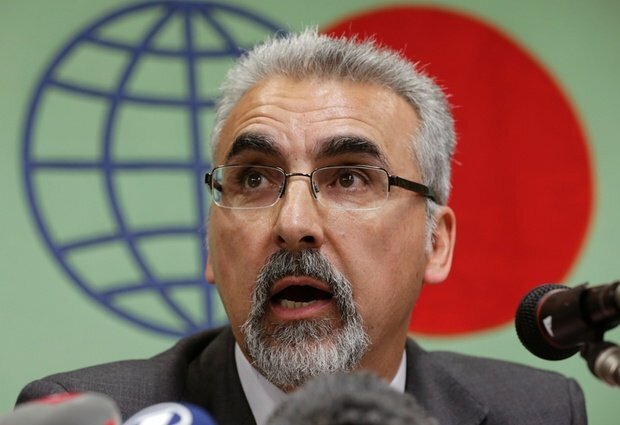 The very next day, after completing a 10 day fact-finding mission, the head of a team dispatched to monitor the decommissioning process at Fukushima Daiichi, Juan Carlos Lentijo, echoed Tanaka’s statement, advising the press that TEPCO should weigh the risks of dumping contaminated water into the Pacific Ocean, as an emergency measure to deal with the increasing amounts of radioactive water on-site. Although the ocean covers nearly two-thirds of the surface of the Earth, it is still vulnerable to human influences, including dumping of waste. These contaminates can have a serious impact on marine life and ecosystems. Toxins and contaminants in the ocean find their way into the food chain, and into our bodies. The world has already witnessed the largest release of radioactive materials into the ocean in the history of the atomic age. While it would be nice to think that TEPCO may be prevented from dumping tritiated water into the ocean, it is very unlikely that this will happen. The situation is out of the control of those who are managing the decommissioning process; they are subjected to realities, not best-case scenarios. They are seemingly just as unable to prevent the eventual release of tritium water into the ocean as they are able to prevent the daily outflow of extremely radioactive materials. In comparison, the dumping of tritiated water will likely have a far smaller effect on the ocean then the continual outflow of contaminated water from the leaking reactor buildings, but that is not in itself justification enough for the action. In 1995, the Global Waste Survey Final Report concluded that the dumping of waste anywhere in the ocean is the same as dumping it anywhere on land. The difference between industrial wastes and nuclear materials is that nuclear waste remains radioactive for decades. Although nuclear proponents claim the risk to human health is small, the long-term effects of nuclear dumping are still unknown. If we wouldn’t dump it on our lands, why should we dump it in our oceans? These facts alone should be enough to prevent TEPCO from taking an “out of sight – out of mind” approach to the issue of contaminated water. Nuclear experts have repeatedly warned that tritium is a significant radiation hazard when inhaled, ingested via food or water, or absorbed through the skin. Environmental advocates also urge leaders to remember that the oceans must be protected from being used as dump sites for all hazardous substances, regardless of their concentration. Marine biologists taught us the link between the ocean’s health and our own. The combined message of all of these people is that the world must protect the environment and marine lives. If cargo ships at sea are found to be deliberately dumping waste overboard, they are banned from doing business in many major international markets. So it is not outside of the realms of expectation to expect that if an industry is unable to prevent the pollution of global waterways, or dumping hazardous materials into the seas, that they would be banned from the use of international waters. Japan’s food industry has already taken a heavy blow in the wake of the nuclear disaster, and further discharge of contaminated water into the ocean would only further tarnish their image and damage the market for exports. The Fukushima Daiichi nuclear disaster has revealed some critical problems with international law. The London Dumping Convention sought to prevent the indiscriminate dumping of hazardous materials at sea, which provides the framework for international control and prevention of marine pollution. However, it is difficult for national authorities to prosecute dumping which occurs in international waters, even deliberate pollution, because it generally lies outside of their jurisdiction. It seems that the continuous batch release of contaminated water will become standard operating procedure at the Fukushima Daiichi facility as long as TEPCO is allowed to remain in control. TEPCO is not a decommissioning and decontamination organization, they are a nuclear operator, and their approach to mitigate and deal with the disaster both before and after March 11th is extremely telling. Environmental contamination is a serious problem, generally found in reverse correlation to the economy. When the economy is down, companies are known to cut corners, and for TEPCO – the sky of their economy is falling down around them. TEPCO is a ghost of its former self, now finding itself bearing the brunt of public wrath, struggling to keep up with the decommissioning process and payments of evacuees, attempting to restart its nuclear reactors in order to restore any hope of profits for stakeholders in the near future, and largely relying on national subsidies and other funds from the Japanese government to even continue basic operations and cleanup work at the Fukushima Daiichi site. At some point, international leaders may get fed up with these continual releases, and may use these actions as justification for combined international control and oversight of the Fukushima Daiichi decommissioning project. Through international support, the contaminated water problems could be dealt with in a more responsible and publicly accepted manner. The question is, how much more will be needed until the tipping point is reached, and international support is not only extended – but demanded?